History and mythology of Angkor Wat. Across the entire outer wall of the Temple of Angkor, you'll find the largest and longest bas relief carving in the world. This 3.6km wall tells the story and mythology of the ancient Khmer empire. 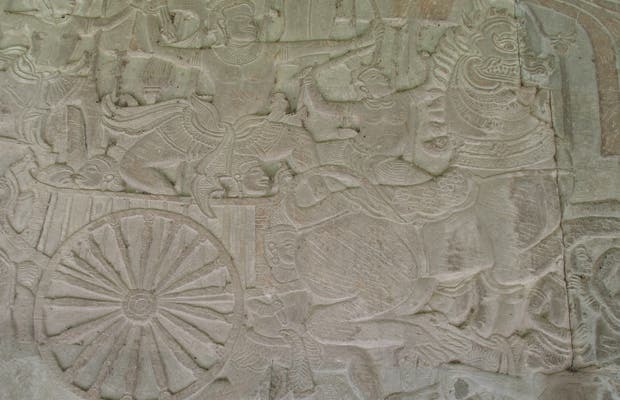 You can see impages of deities, archers, soldiers with shields and spears, on horseback or on foot, boats, elephants accompanying man to battle ... this historical representation was ordered by King Suryavarman II to honour the Hindu gods Brahma, Vishnu and Shiva. This set of mythology, legends, battles, and gods form part of the Mahabharata, the largest epic ever, written in Sanskrit. Much greater than the Iliad and Odyssey combined.